Nokia can sell this cell phone for just $20 and still make a profit. The $20 retail price for the Nokia 105 cell phone is comparable to that of a scientific calculator, but -- amazingly -- Nokia still profits from it. To be sure, the Nokia 105 is as basic as cell phones get. It can't surf the web, it has no app store, and it doesn't even have a camera. But $20 for a phone that can make calls, send text messages and features a color screen is an incredibly good deal. What's more incredible is that the Finland-based company profits $5.80 from the sale of each phone, almost a 30% margin, according to an IHS analysis. Materials and manufacturing costs the company just $14.20 per device. What a world of difference a decade makes. Eight years ago, Nokia's cheapest phone -- the Nokia (NOK) 1110 -- had very similar features to the Nokia 105 but cost more than three times as much. "By keeping features the same for nearly a decade, the Nokia 105 can integrate nearly all system functions into a single chip, dramatically reducing the cost to produce a cellphone," said Wayne Lam, an analyst at the research group IHS, in a research note. The Nokia 105's profit margin is much smaller than the 68% profit margin IHS reports Apple earns from its iPhone 5, but that ultra high-end smartphones retails for more than 30 times the price of Nokia's cell phone. The cell phone cannot measure up to all the features a smartphone offers, but its efficient battery supports 12.5 hours of talk time and up to 35 of standby. Those are factors that appeal to people in emerging markets like Africa, India and Latin America where power grids may be poor or there may be frequent shortages of electricity. That's the segment of the market the Nokia 105 is aimed at. In fact, low-cost cell phones made up 90% of Nokia's shipments in 2012. "While much attention has been lavished on smartphones, the market for simple handsets remains very important to Nokia," said Lam. 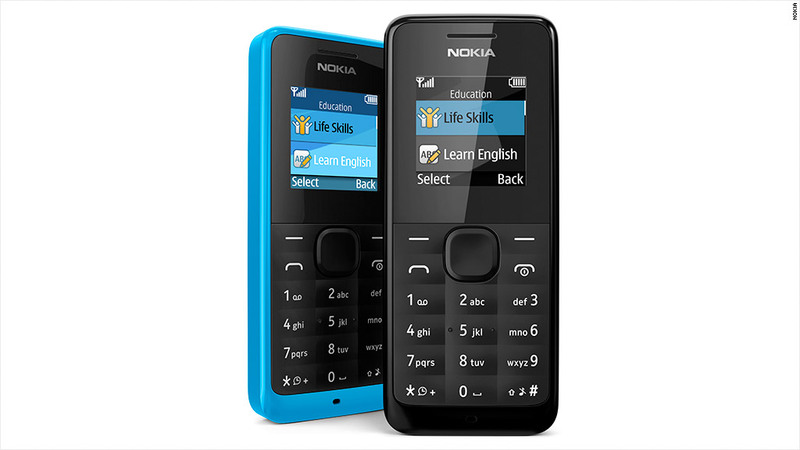 The Nokia 105 also offers a clock, flashlight, FM radio, five games including Sudoku, and an SMS service offering advice about things like parenting and healthy living, as well as local news and movie times. Nokia touts that this service, called Nokia Life, is "like having the internet at your fingertips."